On May 7, the same day the King of Korea abandoned his capital, a small miracle did indeed happen. A local naval garrison of merely 45 Korean ships commanded by a recently promoted captain without any previous naval (let along sailing) experience, inflicted a great defeat on the Japanese navy. The aforementioned detachment snuck upon a large Japanese landing fleet of 70 ships at Okpo. From the distance, the Koreans saw that the Japanese marines were looting and killing Korean civilians all along the shores. Enraged, the Korean captain ordered the bombardment of the half anchored Japanese fleet. Todo had been a fighting man for nearly twenty years and had lived where his illustrious masters died. Throughout the two decades he also had made a name crushing men much bigger than he was as a manner of nature, from conspiracies, expeditions, ultimately to the incorporation of Kyushu under the Toyotomi thumb. For such a general of extraordinary initiative, he knew the fluctuation of combat was not only expected but must be respond to on the spot. Immediately, he ordered the landed forces to fan out its musketeers and respond in a series of volleys against the Korean ships. From the shore he ordered his ships to uproot their anchor and race for the Korean formation, since the Japanese possessed the best boarding parties of the era, any melee they get into will spell favor of them. But all his command failed to make an impact. 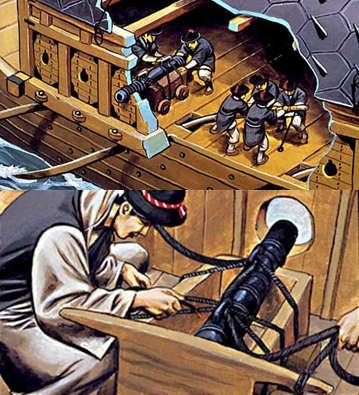 From the distance his muskets did very little damage all the while they were still outgunned by the Korean cannons, and before any of his ships were able to climb aboard the Korean ships, they were all sunk. 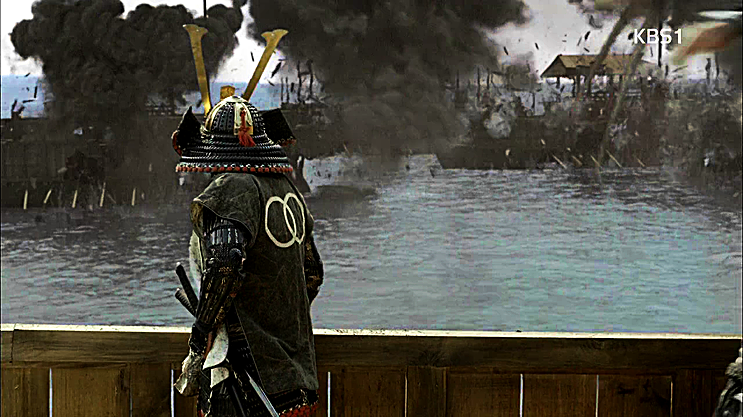 After a desperate hour of fighting, the Japanese threw down their armor and oars and fled by leaping into the seas. At the end of the day, 26 Japanese ships have been sunk, for the Koreans, all they accounted for was one wounded sailor, but trouble was still on the horizon. That same day in the afternoon, the Korean fleet reported the unexpected sighting of 5 great warships from the Japanese. These were originally going to be part of Takatora's invasion force, and had only arrived now with fresh reinforcements. Despite the exhaust from the day's fighting, as a matter of fact the captain's men were already pitching in for a night's rest, the Korean commander ordered his fleet to turn around and engage. He sent out a band of small swift ship to lure the great ships attention. Predictably, they changed course and pursed the small band into open water. 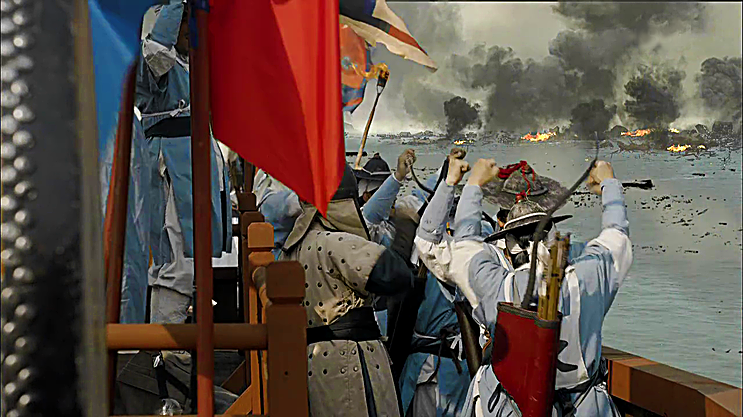 There the Korean formation quickly ringed in around them and bore in with cannon fire. All five of the great ships were sunk. Again, the Koreans did not lost a single sailor. The next morning, the fleet was informed of further Japanese attacks on a stretch not too distant from their anchored position. Immediately, the captain rose his sailors and pursed in the direction of smoke. Again he found the Japanese slaughtering civilians along the shores, again he ordered his ships to fire upon the anchored Japanese fleet. Like the day before, the Japanese fleet was quickly destroyed and many of the landed Japanese took flight into the mountains beside the coast. Nearly all of the 13 Japanese ships were destroyed, but before their complete destruction, the fleet commander ordered the Korean fleet to stop fire. He reasoned that if the Japanese truly lost all ways of escape they would take their vengeance against the civilians of the region as punishment. Instead of wholesale destruction, he left the 2 ships there. As he anticipated, the Japanese took the remaining 2 ships and sailed away overnight. Again, the Koreans did not lost a single sailor. Thus, on the same day the capital of Korea was taken, a lone untested naval commander had sunk 43 Japanese ships (5 of them large command ships) within 24 hours. All that had amounted to his casualties was a single armshot wound on one of his oarsmen from a stray bullet. 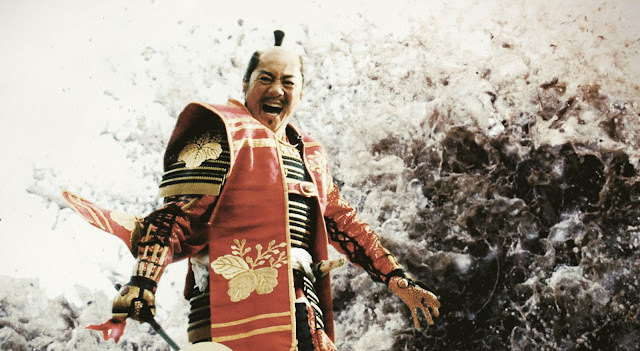 He would go on to deal great blows against the invaders, but what he saw in those two days: of how the Japanese had massacred his own people would stay with him forever as he would confess in his diary. 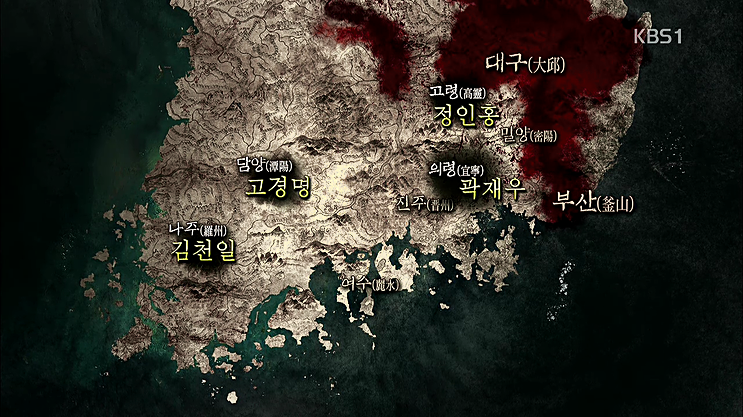 He was quickly promoted to become the Naval Commander of the Three Provinces~ the equivalent of a Korean Admiral. 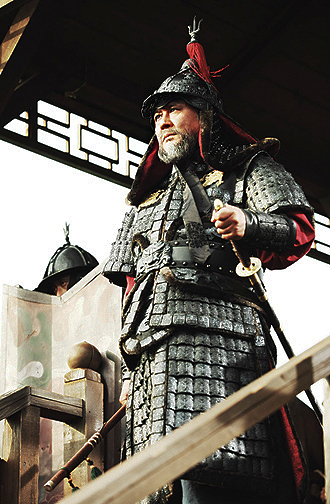 In time, Korea, Asia, and the world would know the name of Yi Sun Shin. 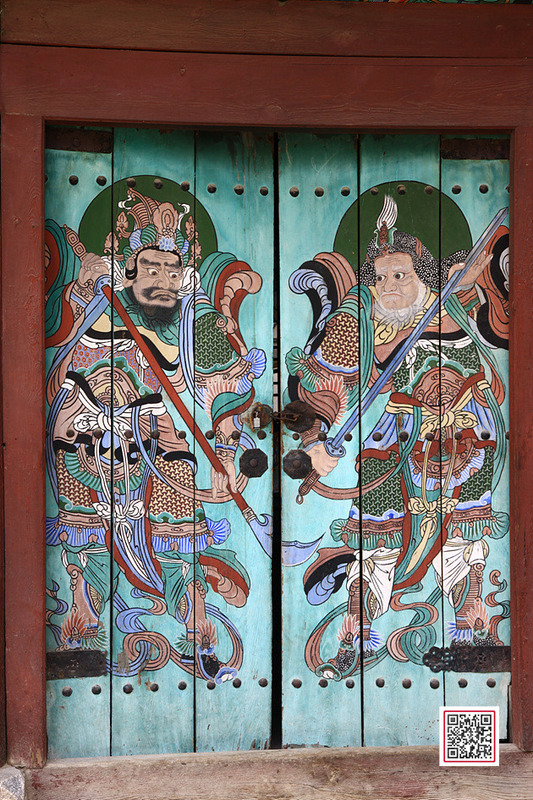 Whatever Okpo, Happo, and Jeokjinpo had been for the captain's sailors, their victories did not have any effect upon the greater climate of the war. All in all these were but one tiny sets of laudable victories out of hundreds of defeats. Small checkmarks amidst a backdrop of panic and chaos. 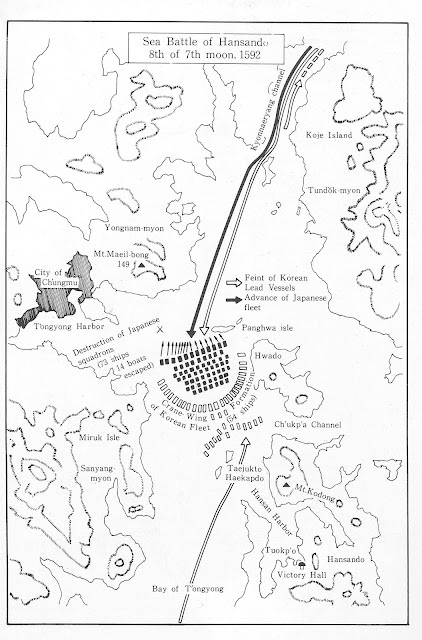 Over land, the Korean garrisons were stranded within the mountain passes and the hill forts, and the Japanese still maintained their sweep northward. Remember~ the riders have yet even reached Beijing to inform them of Korea's misfortune, Pyongyang and northern Korea had yet been taken by the advancing Japanese. However, what this captain did next caused a major halt to the Japanese war efforts. To stop Japan's inland thrust, Yi went after their supply lines on the high seas. 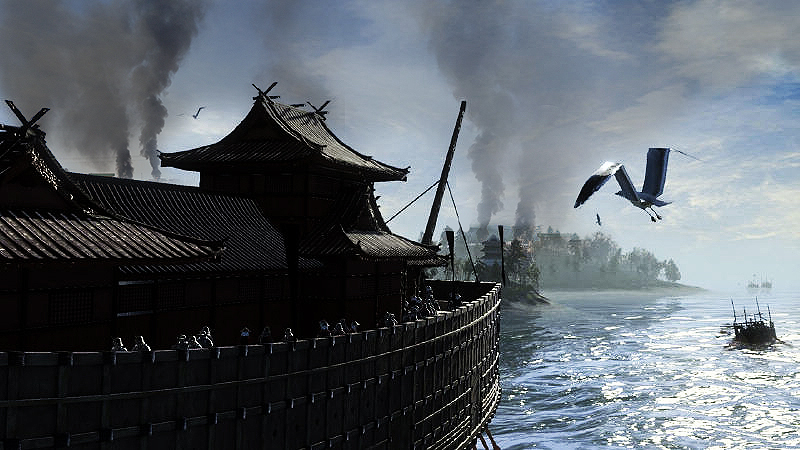 To engage the enemy, which outnumbered his fleet by hundreds, Yi deployed his trump card, his turtle ships. 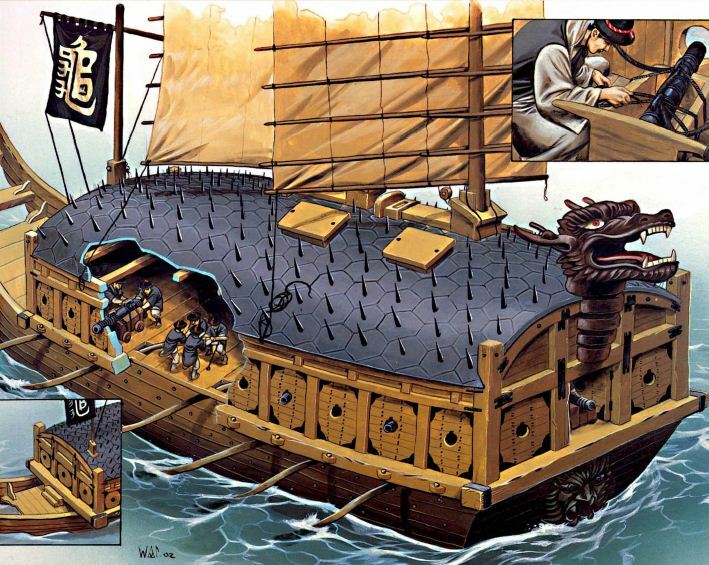 Yi had designed these ships specifically to counter the Japanese threat. They were fortified on all sides and had cannons mounted on all four directions. 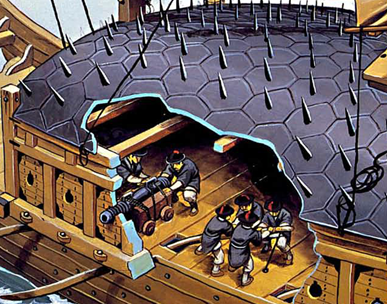 But the most distinctive feature for these hulks was their armored rooftop, which were lined with spikes to prevent Japanese boarding. Fearsome dragon prows were carved in the front which could either shoot out cannon from its gaping mouth or spew out blinding poisoned smoke. Around the end of May, Yi set out eastward and encountered another Japanese force around the Sacheon-Dangpo area, where he engaged in minor skirmishes. Yi began by sending out lures, which the Japanese pursued. 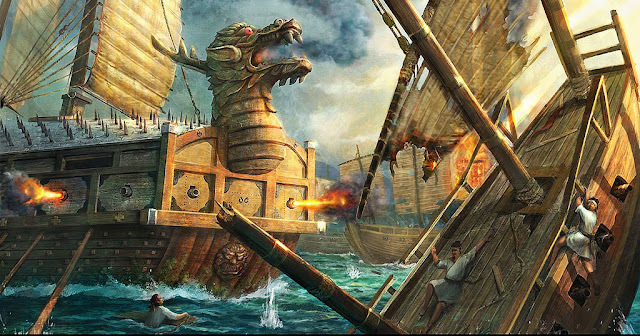 By following the small Korean detachment the Japanese had ran into the entirety of Yi's fleet, Yi immediately sent in the few turtle ships, which sailed directly into the Japanese center and let loosed its cannons on all foes around it. The Japanese tried to jump on it to capture it, but the effort was useless. Simply, there was no way the Japanese could harm it with melee or muskets (as many of their ships lacked cannons.) 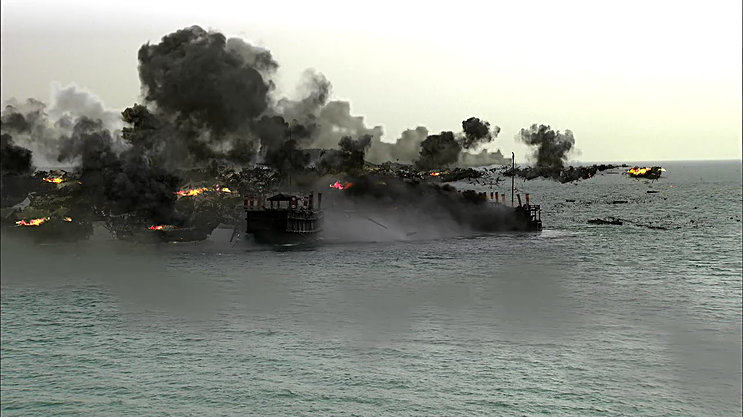 At the end of the day the Japanese fleet's ships splintered and burned around it in the setting sun while Yi's small fleet surrounded them with cannon fire. Not a single Korean vessel was lost. But there were injuries. 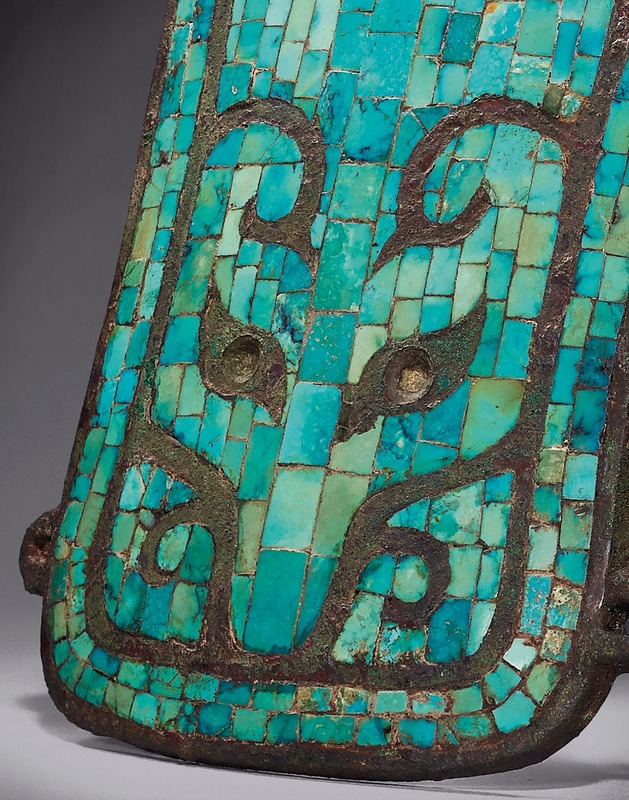 After the battle, when Yi's officers gathered for a debriefing, before they could go over the figures for the next phase of their raid, Yi took out a dagger and dug out a musket ball that had lodged in his shoulder. 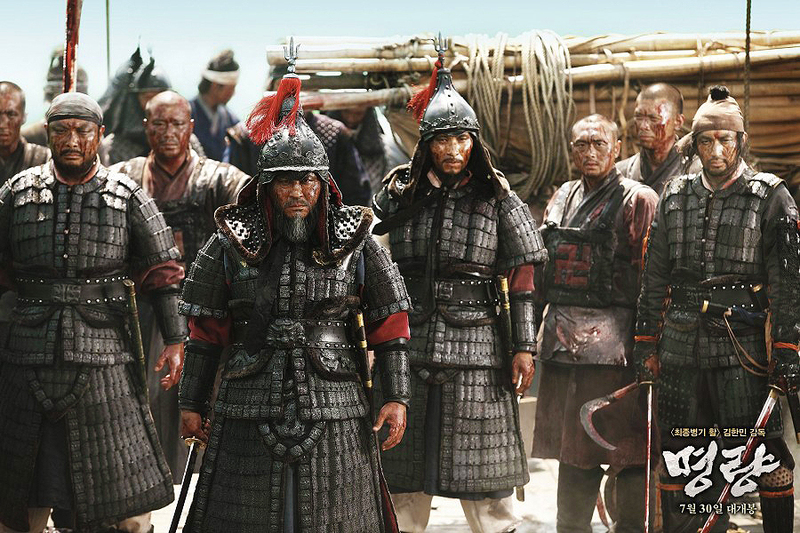 During the entire battle, he had not let anyone know he was injured to maintain morale, and before anyone could make any comment on the matter, Yi simply proceeded over the briefing for the next phase of their assault. Before his navy recovered though, just like Okpo, he received news from the locals that the Japanese are slaughtering civilians at the nearby Dangpo port. And- just like Okpo, Yi sailed posthaste to the hotspot despite his arm's state and the great exhaustion his troops endured. At Dangpo, however, Yi met his first significant force of Japanese. Against the great fleet, Yi sent in all his turtle ships directly into the Japanese center until they are side by side with the Japanese command ship. Shots after shots were buried into the hulking mass. When the command ship tried to maneuver, it was surrounded by another pack of turtle ships, which had by now clotted the entire Japanese formation. 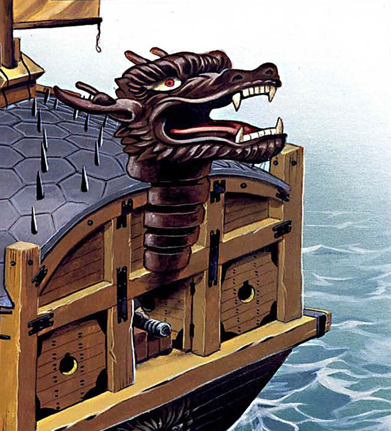 Unable to be both flanked nor challenged, all the turtle ships fired on all sides at every foe around it. Worse yet for the stunned Japanese, by then they realized they are surrounded on all sides by the lighter contingents of Yi's fleet. 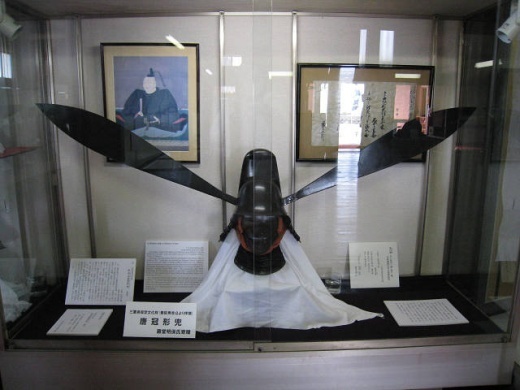 At the height of the battle, one of Yi's sub-commanders shot the Japanese Admiral Kurushima Michiyuki with his bow. Several of the aides quickly leapt on board and cut off Michiyuki's head and hoisted aloft the sails for all to see. Japanese morale quickly collapsed, and the fleet's formation began to disintegrate. At night fall, not a single Japanese ship in the fleet remained, again, not a single Korean ship was lost. 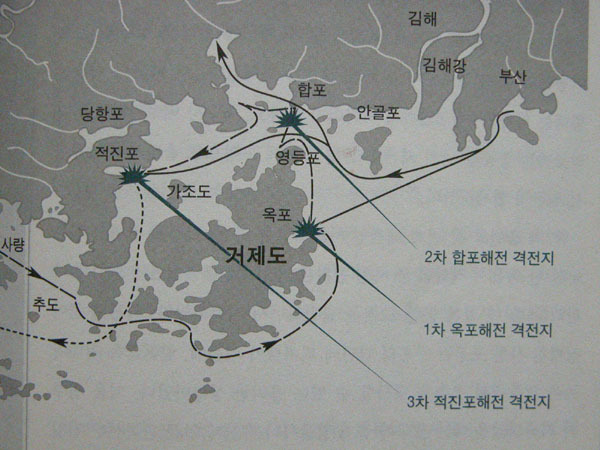 After securing the coastal defenses along the Cheolla province, Yi decided to press his advantage into the Noryang-Hansando area right next to the main Japanese-Korean shipping lane. In total, these extensive raids caused massive supply disruptions to the Japanese army, without the men and the supplies, their momentum were grinded to slower and slower paces. Within weeks, supply to the landed Japanese troops dwindled into a trickle. Hideyoshi was furious when he heard of these strings of embarrassing defeats. Despite the continual gains on land, despite the fact that Korea was on its last legs, all was for naught. 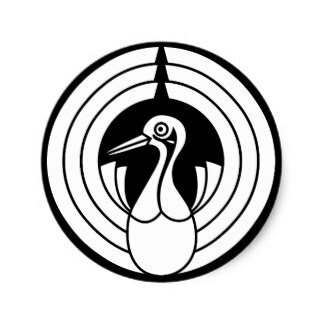 In the small patch of ocean between the Japan and Japanese- occupied Korea, this little known Korean pest had the audacity to make it into a private lake. This one single troublemaker had ruined all his careful preparation and taken down his best soldiers without even letting them be used properly on land. Within the first few months of the war everything had been happening as it should, as befits the hard work of veteran warriors (now included taking of Seoul and encircling around Pyongyang~ by this point the messengers have only arrived in Beijing alarming the Ming court that Seoul had fallen, if just to illustrate what Yi was able to achieve within a single month since Japanese landfall) but all are halted in just a month. Everything was so close, the Koreans had been scattered like he expected, he was so close to the boarder of the Ming empire as he wished, he had done everything that would expand his ambitions- now, his soldiers have stopped, his admirals have been halted in disgrace and dishonor, even his inner circle are whispering against him. No more, no more exertions elsewhere, no more unprotected supply columns, no more letting this little pesky Korean amateur ruin his greatest conquest for all of Asia. 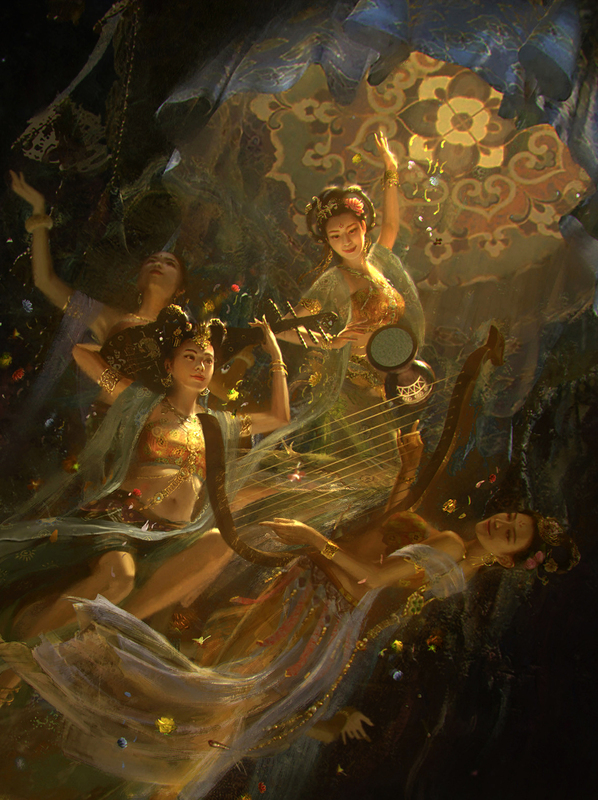 Yi would be dealt with once and for all- with all he could bear on the high seas. Hideyoshi would order all of his fleets to be pooled together for a massive sweep against Yi's hidden forces. What came next on paper should look like a turkey shoot, a naval genocide from three simultaneous directions. But what actually came was Asia's Cannae. 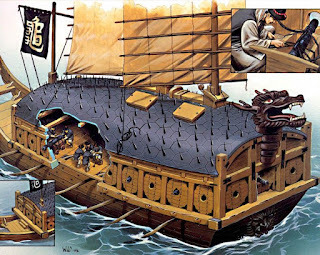 To fully appreciate the battle, I have devoted a short and specific post about the differences in ship construction and doctrine employed by both the Koreans and the Japanese, it will explain some of the main factors why Yi was able to repeatedly win against numerically superior foe with such small losses~ hint: his sweet sweet ships. Please check it out! 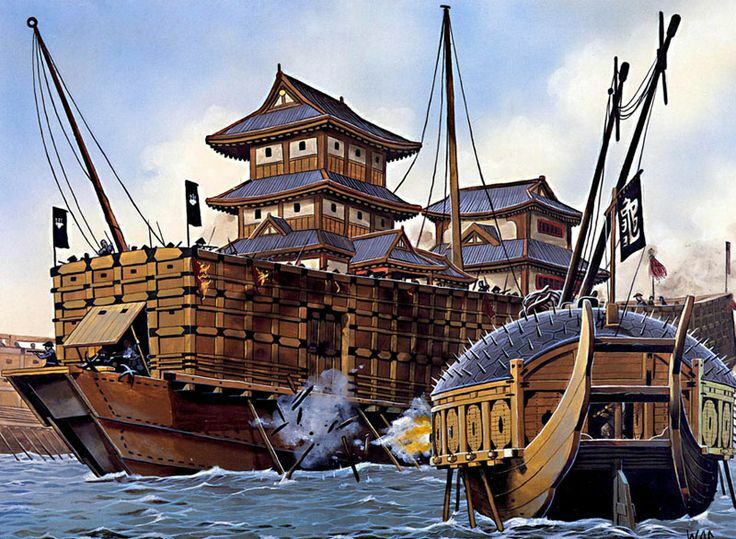 To Take down Yi, Hideyoshi had ordered nearly 200 ships to gather, they were to be commanded by 3 veteran admirals, all with experiences in naval warfare. But during the gathering process, Wakizaka Yasuharu, one of the 3 admirals became annoyed by the crawling rate of the assembly. Instead of waiting like the rest, he took initiative and broke off from the others and searched for Yi with his 73 ships. Again, Yi lured them on with just a skirmishing detachment, but by this time, Yi has had so much successes with this feint that he crafted his entire strategy around it. With only 56 ships, Yi must make each of them count in the fight ahead. 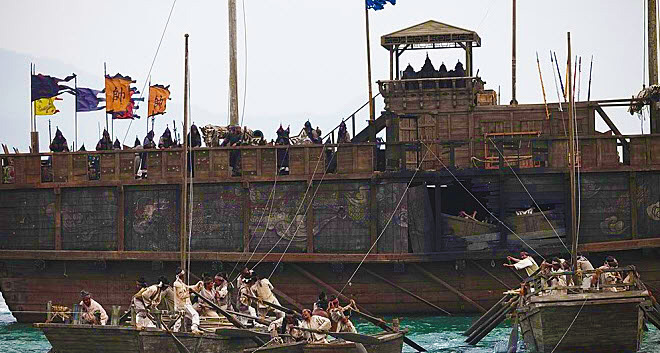 Already this was shaping up to be one of the largest naval battles in world history. Yi called it the "Crane's Wing Formation," he would deploy his entire fleet hidden among the islands that littered around the Hasando Straight. Under the moonlight they waited in the shallows behind the rocks and the small forested isles. Yi knew that despite the massive numerical advantage of his foes, his sudden ambush would catch them unaware, specially between the tight islands that obstructed their turning radius. He also knew that despite pitting each of his few ships against at least 2 or 3 enemy ships in the coming battle, because of his ship's construction not only are they fully capable of holding their own against such odds, but could create panic when they are discovered all around the Japanese fleet. The combined effect of their simultaneous barrages would demoralize the Japanese, and the tight deployment of the Japanese formation would make them clogged, unable to turn, rally or breakout in unison. Yi watched as his small detachment lured the Japanese pursuers slowly pass each small sets of islands. In the long stretch of their many- mile chase they were utterly oblivious to the individual islands around them until these pine rocks became a blur to them. Then the Crane's Wing descended around them from all sides. In the twilight, drums suddenly rang out simultaneously as Yi's ships quickly closed in around the massive Japanese fleet in a ring, within minutes they were positioned all around the packed Japanese fleets. They turned their sides and all unleashed their broadsides into the packed lane. Cannon flash and gunfire ripped through the sea air for hours, from early morning to late afternoon. 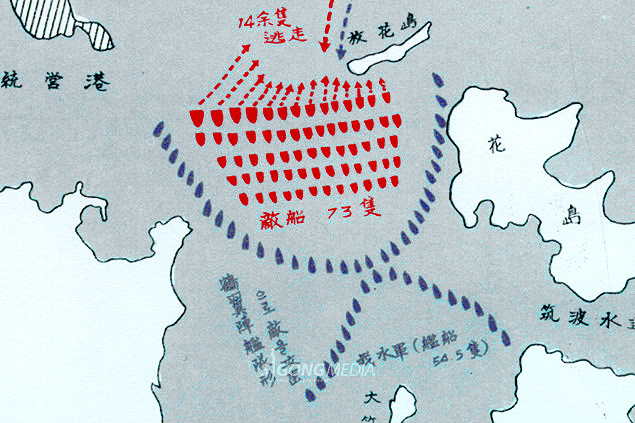 But at the end of the battle, 47 of the Japanese ships were sunk, and 12 were captured by Yi's marines. Only 14 managed to retreat back to Busan and rejoin the rest of their comrades. Still, not a single Korean ship was lost. 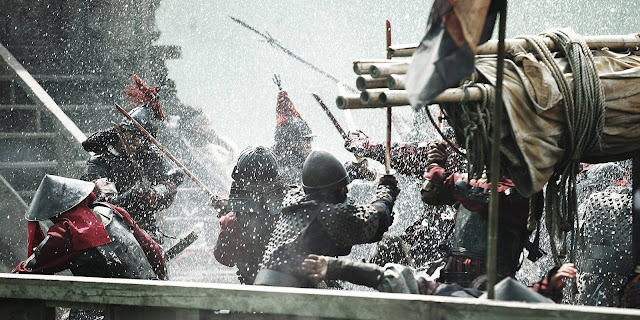 The next day, Yi would seek battle with the other 2 admirals. This time, the Japanese learned their lesson and remained firmly bolted, no matter how Yi baited them they did not pursue the Korean squadrons. To dislodge them, Yi sent in small cannons ships to ring around the Japanese fleet and bombarded them out of musket range. Though it was time consuming, by the end of the day the remainder of the Japanese fleet scattered. Yi still did not loss a single Korean ship. But Yi's momentum was grinded to its limits, between the two day's fighting, and the full month of exertions (remember, it still had been only a month and a week after the beginning of the invasion, Ming relief column had just been sent and Pyongyang had just been taken by the Japanese army, to the majority of the Koreans their country was still on the brink of ruin) Now, burned out and wounded, Yi must tend to his spent troops. But as fate would have it, 6 days later after hearing the news of the catastrophe at Hansan Island, Hideyoshi would begrudgingly order all offensive naval operation to stop, restricting them to only defending fortified Japanese ports. But Yi was not done yet. By early September, nearly two months since the landfall, the entire Japanese fleet would be ordered to stay put within the fortified harbor of Busan. There, 500 Japanese ships gathered under the protection of cannons that ringed the cliff-side overlooking the harbor entrance. Despite only fielding 166 ships, Yi bombarded the Japanese fleet from afar. The Japanese had fully learned their previous lessons, by now, none gave chase to the Koreans. Yi inflicted over 130 losses to the Japanese navy there while loosing not a single ship, but despite this victory wasn't able to achieve a complete victory that would sever the Japanese expedition completely from relief from their mainland. 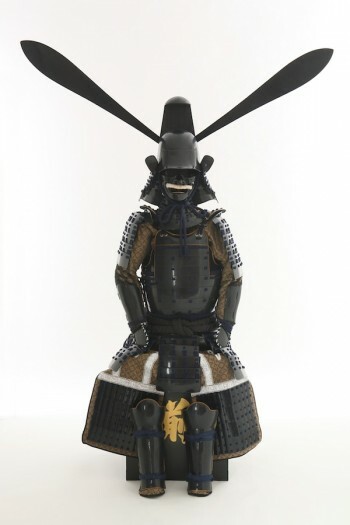 Still, Hideyoshi has had enough, and before the closing of fall in 1592 he ordered all naval operation to stop. The thrust of his early victories ended there. With one stroke, this nobody had saved Korea and halted a foe right outside the doorstep of Ming China.